Our product range includes a wide range of complete earthing material, earthing material and gmax safe earthing electrodes. 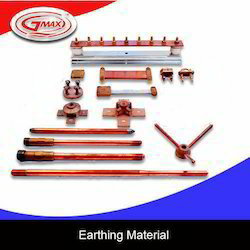 For reasons of quality maintenance, the offered range of Complete Earthing Material, is manufactured in compliance with the set industry norms and guidelines, utilizing the finest raw materials and modern machines. This ensures the product’s strength, performance, service life and capacity. Further, the offered range is known to be marked at the most reasonable rate possible. A stroke of lightning caused the generation of fault current that is highly potential to damage the electrical gears. Sometimes, the power supply also generates the fault currents that are considered as a direct threat to constructed area having electrical facilities and people.Hence, the grounding or earthing system has become quite indispensable to scatter away the fault current that keep precious electrical and electronic equipment safe and secure.In the domain of electrical or electronics, earthing/ grounding is a method to send the fault current to the ground using metal parts. Grounding or earthing is a conductor in an electrical wiring system that offers low impedance channel to the earth to avoid hazardous voltages.Hence, if a fault gets connect to exposed conductive surface within an electrical device, the copper coated safe earthing electrode system keeps it safe from any kind of damage occur by the fault current. Sometimes, we are not able to understand the reasons of the fault current that increases the importance of grounding solutions for protecting valuables.Gmax being one of the key Earthing Electrodes Manufacturers, has been incorporating novel designs along with cutting edge technology, we have been providing the industry with highly effective and cost efficient Copper Bonded Earth Electrodes in different sizes.Copper bonded grounding Electrode has been considered as the most apt equipment for earthing purpose owing to excellent resistance to oxidization. 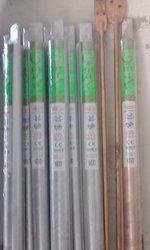 The main copper coated earth electrode is saved by the copper bonding from corrosion and the crystalline mixture is filled within the electrode. 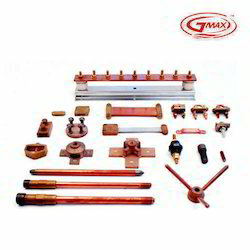 Designed on the principle of Flat-in-pipe technology, we coat copper earth electrode using 100 micron of copper. With a crystalline mixture, the annular space between the inner conductor and the external conductor is filled. After that, it is sealed cautiously from both the ends. Due to the anti corrosive and extremely conductive nature of crystalline mixture, it has been used. It also offers low impedance grounding that is necessary for protecting transmitting facilities as well as personnel from any kind of internal or external electrical inconsistencies. Looking for Complete Earthing Material ?